Here’s one beer that I won’t be selling anytime soon, and you probably have never heard of - “Buval Pils”. This is the beer sold in Aldi, the discount supermarket chain found all over Europe. What’s striking is how similar the design of their can looks to the Jupiler cans that us Belgians love to so much (apparently 44% of all beer sold in Belgium is Jupiler). Our country’s biggest brewer, AB Inbev is trying to sue the brewer behind the Buval Pils. One that hardly anyone has heard of, called Martens, who are based in Limburg in the east of Belgium. What’s so strange about this brewery is that, even though nobody has heard of them, it’s Belgium’s second biggest brewery after AB InBev. Martens doesn’t brew anything as tasty as Westvleteren 12 or Belgian Trappist beers, but they do produce a very large amount of beer for supermarkets like Aldi, Carrefour, Cora and Metro. Eighty five percent of our their output is exported. Martens is a family business based in Bocholt, that’s been around since 1758. What’s remarkable is that the produce beer in PET bottles (common single use plastic bottles). Beer is seldom found in plastic bottles - this brewery started doing it after in 2003 Germany (where they export a lot of their beer to) started taxing beer in cans. The company immediately invested 15 million EUR in to the research and development of brewing beer for plastic bottles, to overcome the hurdle of extra taxation by the Germans. After just 8 months of R&D, things were ready for production. Meanwhile beer in plastic bottles is being sold not only in Germany but also in Italy, Spain and France. These bottles are actually 100% recyclable so the impact on the environment is (hopefully) minimal. 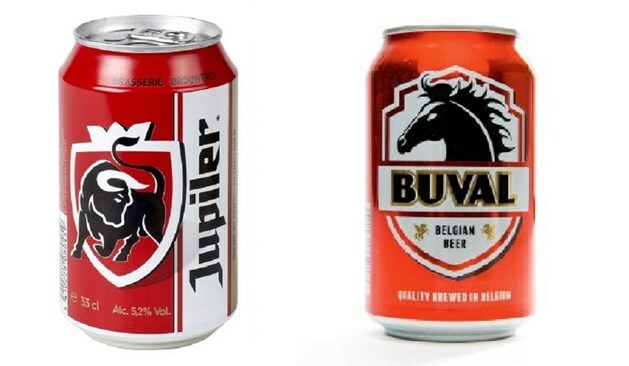 Now, in response to the legal problems that Aldi is having with AB Inbev regarding the design of the cans, Aldi says that there have been a few redesigns but the colours of their beer has always been the same as that of Jupiler. Yet AB Inbev has never made a problem of it. Is AB InBev just trying to attack a competitor? Hard to tell. While I love all Belgian beers, I don’t recommend you go out of your way to buy beer from Aldi. Instead try out one of our lovely Trappist beers, buy Westvleteren 12 or try some local craft beer instead.